Ultrafast acquisition rate of one million waveforms per second, real-time compensation of transmission losses (de-embedding) between the signal source and oscilloscope, and silent operation even at full load – these are just some of the benefits of the high-performance R&S RTP oscilloscope family. Rohde & Schwarz introduces the new high-performance R&S RTP family, expanding its oscilloscope portfolio in keeping with its motto “Oscilloscope Innovation. Measurement Confidence.” During the development of the new oscilloscope family, the innovative T&M expert particularly focused on measurement accuracy, speed, a wide range of functions and future-proof technology. The R&S RTP combines various instruments better than any other oscilloscope in its class. All these features make the R&S RTP the oscilloscope of choice for debugging, e.g. 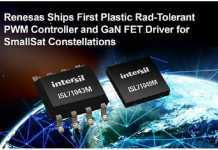 embedded components with fast digital or wideband RF interfaces. 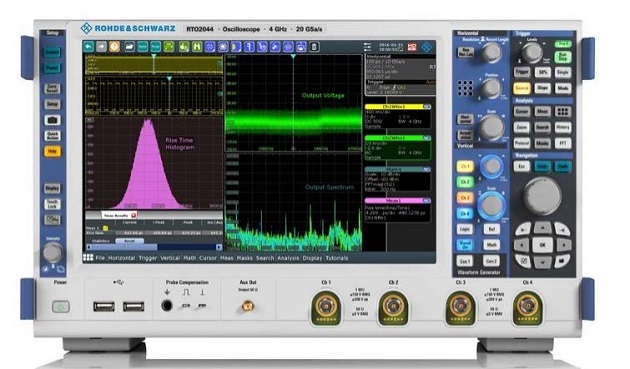 The R&S RTP is now available from Rohde & Schwarz as a 4 GHz, 6 GHz or 8 GHz model. The R&S RTP high-performance oscilloscope family combines signal integrity with a high acquisition rate. In standard acquisition mode, it can measure a million waveforms per second, making it more than a thousand times faster than other oscilloscopes in its class. This helps users to find sporadic errors much faster. It is the only instrument on the market that compensates transmission losses from the signal source to the oscilloscope (de-embedding) in real-time. The advantage is that the oscilloscope is still extremely fast even with signal correction activated. And thanks to its unique digital trigger architecture, it can precisely trigger on compensated signals. A further feature of the R&S RTP oscilloscope that saves developers a lot of time is hardware acceleration for a range of analysis functions. Mask tests, histograms and frequency domain analyses can be performed at high speed for fast results with high statistical reliability. The high-performance R&S RTP combines multiple instruments better than any other oscilloscope in its class. 16 logic channels, four voltage channels, and four current measurement channels are available in addition to the analog oscilloscope channels. The R&S RTP supports protocol analysis of serial bus interfaces and offers powerful spectrum and signal analysis functions. Thanks to its wide range of tools, users can test many different types of signals from complex circuits time-correlated with each other with just one T&M instrument, and find related errors faster. 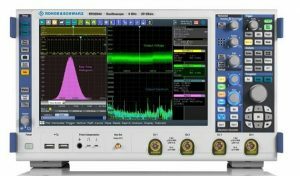 The new high-performance oscilloscope from Rohde & Schwarz addresses electronics developers in the wide-base market, particularly in the fields of aerospace and defense, automotive, industry and telecommunications. 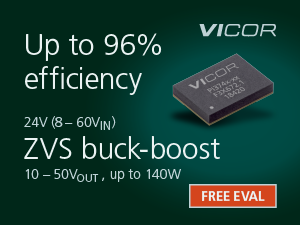 It is ideal for debugging electronic circuitries with different signals during development, including high-speed buses (USB, PCI Express, MIPI, etc. ), multichannel RF interfaces (radio or radar), DDR memory interfaces, complex power management units, and even simple control and programming buses (I2C, SPI, etc.). The R&S RTP can test all applications where high-resolution signals need to be measured with a wide dynamic range and high sensitivity in the time and frequency domains. Despite its comprehensive range of functions, the R&S RTP is the most compact high-performance oscilloscope on the market, with a footprint up to 40 percent lower than conventional models. Thanks to the sophisticated cooling concept and the silent fans, the quiet instrument never disturbs lab operations. 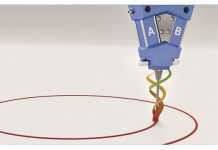 The high-performance R&S RTP family is a very secure investment. 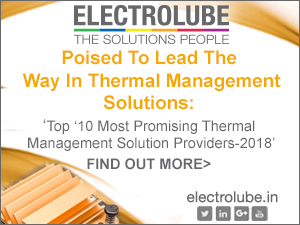 If T&M requirements increase, the measurement bandwidth, memory depth and range of functions can easily be upgraded with hardware and software options. 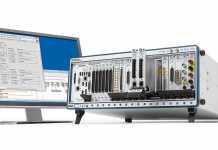 Rohde & Schwarz is planning additional enhancements to the R&S RTP family. More hardware options, such as a generator module with two analog and eight digital channels and a 16 GHz differential pulse source, are planned for 2018. Further R&S RTP models with a higher bandwidth will follow in 2019. Rohde & Schwarz, a committed oscilloscope provider with many years of experience, is expanding its portfolio with the R&S RTP family. Rohde & Schwarz will give the first public demonstration of the R&S RTP family at the International Microwave Symposium (IMS2018) in Philadelphia from June 12 to 14, 2018. The R&S RTP high-performance oscilloscope is now available from Rohde & Schwarz as a 4 GHz, 6 GHz or 8 GHz model. 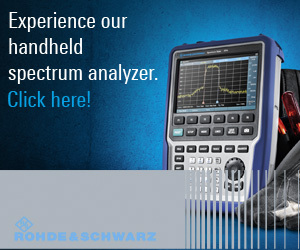 For more information, visit rohde-schwarz.com/rtp.